Ricky Garcia Photos, News, and Videos | Just Jared Jr.
Just days after Knight Squad aired its’ series finale, Daniella Perkins‘s new series released its’ first sneak peek! The -year-old actress is set to star as Ruby in Brat’s Red Ruby, which centers on a group of students who were trapped in a cave for 25 years as they emerge into society bringing the reality of vampires with them. FIYM‘s Ricky Garcia, Fuller House‘s Michael Campion, Madisyn Shipman, Ysa Penarejo, Noa Drake and more star in the series, which premieres on April 29th. Check out the first sneak peek below! 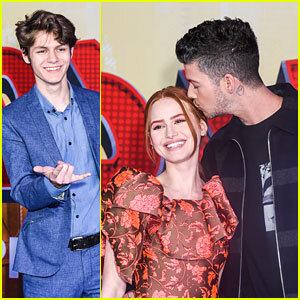 Travis Mills kisses girlfriend Madelaine Petsch on the carpet at the Spider-Man: Into The Spider-Verse premiere held at Regency Village Theatre on Saturday (December 1) in Westwood, Calif. The couple was joined by Ty Simpkins, Forever In Your Mind‘s Emery Kelly and Ricky Garcia, Amarr M Wooten, Black Lightning‘s Marvin “Krondon” Jones, Prince of Peoria‘s Gavin Lewis, and Max Ehrich. Also in attendance were stars of the movie Jake Johnson, Shameik Moore, Kimiko Glenn, Brian Tyree Henry, and Lauren Velez, as well as Adina Porter, rappers Swae Lee and Ty Dolla $ign, Garcelle Beauvais, Johnny Knoxville and family, and Angel Parker. Spider-Man: Into The Spider-Verse swings into theaters on Friday, December 14th! FYI: Madelaine is wearing a Paule Ka dress and APM Monaco earrings. Kimiko is wearing a Thai Nguyen jumpsuit, Le Silla shoes, Eriness jewelry, and an Atelier Swarovski bag. Asher Angel and Jenna Ortega make silly faces in this fun shot from his 16th Birthday Celebration held at Blind Dragon on Sunday night (October 28) in Los Angeles. The two Disney stars were joined by a ton of other pals and celebs to celebrate Asher‘s birthday, which was Nintendo themed. Landry Bender, Liam Attridge, Ricky Garcia, Emery Kelly, Emily Skinner, Peyton Elizabeth Lee, Sofia Wylie, Joshua Rush, Isaak Presley, Olivia Rodrigo, Madison Hu, Bailee Madison, Annie LeBlanc, Olivia Sanabia, Sadie Stanley, Nia Sioux, Lexi Jayde, Mason Ramsey, Madisyn Shipman, Ross Butler, Navia Robinson, Sky Katz, In Real Life plus, Asher‘s fam all came out to celebrate with him. Guests were able to play a game or two of Super Mario Party for Nintendo Switch, enjoyed Nintendo-themed sweets and documented the fun on social media. Asher was even presented with a Mario Party themed birthday cake! Forever In Your Mind Drop New Single 'Let Go' - Listen & Download Now! 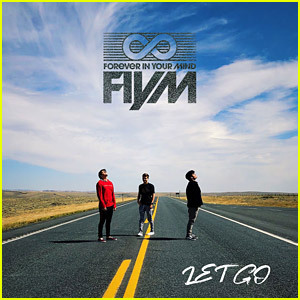 Forever in Your Mind is back with a brand new song called “Let Go”! The guys – Emery Kelly, Liam Attridge and Ricky Garcia – have dropped their first single since parting ways from Hollywood Records and it’s so good! Pick up the track on iTunes now and stream below! Peyton Elizabeth Lee, Jenna Ortega & More Disney Stars Hit Up Halloween Horror Nights! Talk about squad goals!!! Disney stars united for a fun night out at Universal Studios’ Halloween Horror Nights over the weekend. 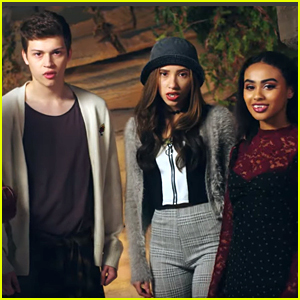 Andi Mack‘s Peyton Elizabeth Lee, Asher Angel, and Luke Mullen, Zombies‘ Meg Donnelly, Stuck In The Middle‘s Jenna Ortega, and Best Friends Whenever‘s Landry Bender and Ricky Garcia all enjoyed the haunts. “well if this isn’t cute 👻,” Landry captioned the photo. Luke also shared a photo with Landry, and Asher photobombing in the background. “Mother and child,” he wrote. Jenna actually took the photo! To see group photos with zombies at the event, check them out on Peyton‘s Instagram account here! Peyton Elizabeth Lee & Sky Katz Support Asher Angel at LA Family Day! Asher Angel had some of his closest friends in the audience at LA Family Day! The 16-year-old singer and Andi Mack star got support from Peyton Elizabeth Lee and Sky Katz at the event on Saturday afternoon (October 6) at The Grove in Los Angeles. The annual event to support the TJ Martell foundation was hosted by Meg Donnelly and also featured performances by Maddie Poppe and Cali Rodi. Other attendees included Luke Mullen, Forever In Your Mind‘s Ricky Garcia, Ryan Ochoa, Zachary S. Williams, Modern Family‘s Jeremy Maguire and Mackenzie Hanesicsak. In addition to amazing performances from Asher, Maddie and Cali, guests were treated to fun snacks like Halo Top ice cream and Sprinkles cupcakes…all while playing carnival games! Proceeds from the event benefited TJ Martell foundation and their mission to fund innovative medical research to cure cancer. For more information about the TJ Martell foundation, visit their website.